Oinsá Timor-Leste hetan dolar biliaun sanulu . . .
... no oinsá ita sei gasta tomak ho lalais. La’o Hamutuk apresia nivel transparénsia Timor-Leste kona-ba reseitas gas no petróleu, no informasaun iha artigu ida ne’e mai husi fontes publikasaun ofisiál. Ami enkoraja ema-hotu atu lee no kompriende faktu esensiál sira ne’e, nune’e ita-boot sira sei hetan informasaun no involve iha diskusaun polítika no foti desizaun nian. t$ 829 retornu husi investimentu Fundu Petrolíferu. Gráfiku iha liman los halo boot barra ki’ik lima iha gráfiku anterior hodi hatudu rendimentu royalti (FTP – First Tranche Petroleum) husi kada kampu no kada produtu. Kada pagamentu aproximamente 9% husi rendimentu brutu ne’ebé kompañia sira simu husi fan produtu ne’e durante fulan anterior no presu mina-rai matak iha merkadu mundiál (liña mean). Gas natural husi Bayu-Undan dada ho kadoras ba Australia, atu halo likifasaun no tula ho ró ba Japaun. Osan ne’ebé Japonés sira selu husi sosa gas, ne’e tuir presu mina-rai mundiál refleta ba iha pagamentu husi kadoras/planta LNG ba konsorsiu Bayu-Undan, no refleta ba iha royalti ne’ebé kompañia sira selu ba Timor-Leste (90%) no Australia (10%). Ho rekursu naun-renovavel hanesan mina-rai no gas, pasadu labele halo prediksaun ba futuru. Bainhira rezerva mina-rai no gas iha Bayu-Undan no Kitan maran tiha, produsaun no reseitas sei menus. Gráfiku iha liman los uza prediksaun presu mina-rai no inflasaun ne’ebé Ministériu Finansa Timor-Leste uza, no hatudu katak ita nia total rezerva gas no mina-rai nato’on de’it atu suporta metade gastu estadu iha nivel ohin loron. Ida ne’e sei hamamuk Fundu Petrolíferu iha inísiu 2022, tinan rua molok produsaun Bayu-Undan remata, hanesan ami esplika iha ami nia blog foin daudauk ne’e. Ema balu hanoin katak ami nia asumsaun iha blog ne’e konservativu demais, nune’e ami halo fila fali kalkulasaun ho estimatizasaun optimistiku liu (menus prudente) ba presu mina-rai. Gráfiku iha liman los, bazeia ba projesaun “Reference case” foun liu husi Energy Information Administration (EIA) Estadus Unidus, hatudu katak Fundu Petrolíferu bele sei maran iha 2023. Ida ne’e tinan lima tan hafoin kauza polítika ohin loron nian. Maske nune’e, projesaun presu mina-rai nian ne’ebé as liu fali projesaun konservativu (entre EIA nia “Low case” no “Reference case”) ne’ebé Ministériu Finansa uza hodi kalkula Rendimentu Sustentável Estimadu Timor-Leste, sei aumenta tempu moris tinan rua de’it ba Fundu Petrolíferu. Ho sorte, reza, krize mundiál no ekonomia global ida ne’ebé forte ba dékada balu oin mai, presu ba fan mina-rai bele sai as hanesan EIA nia “High case.” Maske ami hanoin ida ne’e sei fó risku ba futuru planeamentu Timor-Leste ne’ebé bazeia ba mehi, ami modela “case” ida ne’e mós, hanesan hatudu iha liman los. Modelu ida ne’e fó de’it ita tinan lima tan ba Fundu Petrolíferu—tempu nato’on ba labarik kosok oan sira ne’ebé moris ohin loron atu remata eskola sekundária. Redús kreximentu despeza Estadu, asegura katak osan gasta ho matenek ba atividade ne’ebé sei prodús retornu ba povo Timor-Leste. Investe ba iha ita nia povo – asisténsia saúde, edukasaun, sanitasaun, bee mos, estrada rurais – duke ba iha projetu infrastrutura ne’ebé boot, atraitivu ne’ebé barak liu benefisia kompañia estranjeiru sira no ema riku balu. Haforsa ita nia ekonomia naun petróleu no produtivu, espesialmente agrikultura no indústria ki’ik, atu redús dependénsia ba importasaun no fornese fontes rendimentu no nesesidade ba ita nia povo hafoin osan mina-rai maran hotu tiha. Foti responsabilidade ba ita nia dezenvolvimentu rasik, duke sadere ba investor estranjeiru, emprestador, kompañia mina-rai internasionál, vizitantes, no importasaun sasán, servisu no peritus. Ida ne’e haruka ita nia osan no riku-soin naun renovavel sai husi Timor-Leste, estraga ita nia patrimóniu petróleu no husik uitoan de’it atu hatudu ba jerasaun futuru sira. Please join us to celebrate La'o Hamutuk's 12 Birthday! 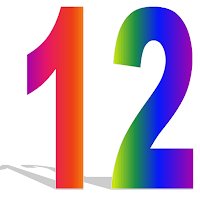 La'o Hamutuk la'o ona tinan 12! 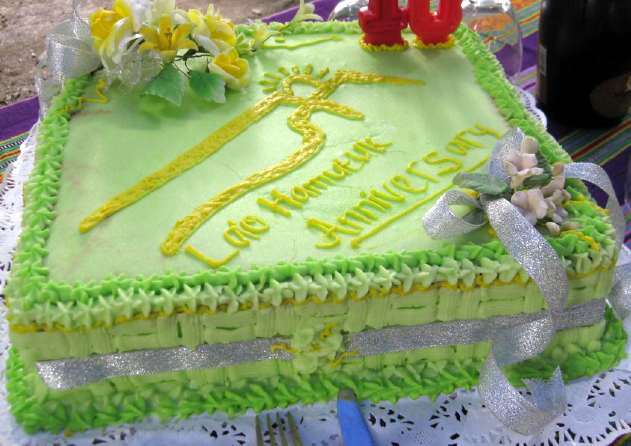 La'o Hamutuk joins with all citizens of Timor-Leste and their supporters all over the world in celebrating the tenth anniversary of the Restoration of Timor-Leste's independence. Now that we have consolidated the state, it is time to build a sustainable and equitable economy which can provide for economic and social justice for all the people in Timor-Leste. Ten years from now, Timor-Leste will be at a critical point in our history, as we were ten years ago. Our producing oil fields will be running out, our Petroleum Fund may have been spent, our youth population will be much larger, and we will be repaying the principal on today's debts. We hope we will have developed economic sovereignty to go with our political sovereignty, and suggest a few recent documents to provide information and motivation to achieve this critical goal. Download this invitation in English or Tetum. Timor-Leste is the second-most petroleum-export dependent country on earth, but our oil and gas resources are limited. This determines our State, our economy and our future. Timor-Leste has almost no industry and an embryonic private sector, but state spending in growing faster than every country except Zimbabwe. Our “baby boom” is entering school, and we have just taken out our first foreign loans. What does the future hold? Current development plans, centered on physical infrastructure, will not provide a sustainable improvement in our people’s lives. The unrealistic dreams of the Tasi Mane project rely on the petroleum industry and Greater Sunrise gas, which may never come here. Impunity for past crimes, especially those committed as part of the Indonesian occupation, undermines the rule of law today and tomorrow. Land is the basis of our culture and lives, and recent events could increase injustice and conflict. Thank you for your interest and participation. Please let us know if you plan to attend. La'o Hamutuk submitted the following report in Tetum and English to the National Elections Commission and other relevant officials on 30 April 2012. Liga ba versaun Tetum. Link to printable English version. We observed in Dili, polling centers EPS. 30 de Agostu, EP. Fatuhada, E.P. 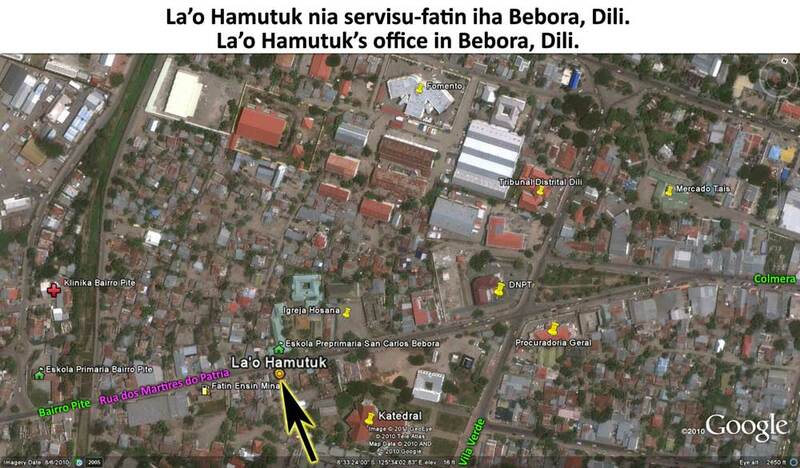 10 Dezembru, Sede Suku Kampung Alor, Sede Suku Bidau Lecidere, E.S. 12 Novembru and EP. 02 Bidau, Ep Farol; in Baucau District - Sede Suku Letemumu; and Lautem District -EP. No 1 Tutuala. La’o Hamutuk is a Timorese national organization dedicated to monitoring and analysing the development process in Timor-Leste. As a FONGTIL member, we were accredited by STAE several months ago, authorizing us to observe the 2012 presidential elections. La’o Hamutuk congratulates all the people who participated in the second round of the elections, voting freely, peacefully and conscientiously. We also congratulate STAE, CNE and all the entities that provided technical, intellectual and moral contributions to the entire election process, so that the whole territory was violence-free. From our observation at the polling centers, we noticed some improvement from the first round, but not enough considering the law’s requirements. At the polling centers Sede Suku Kampung Alor and Sede Suku Letemumu, the police respected the 25 meters legal distance, and when they voted, they took off their gun or other arms. However, at the polling center EPS. 30 de Agostu-Comoro, the policemen kept going in and out of the polling station, and did not wear any emblem or identification showing their identity as PNTL security staff and their unit. The polling center E.P 10 Dezembru-Comoro was visited by STAE Director, who shook hands with police inside the polling station. We noticed that this act did not respect the distance imposed to police at the polling centers, and that STAE authorities did not respect either the rules concerning their security role inside the polling centers. At the polling center EP.02 Bidau, the police sat very close to the polling station, smoke with STAE officials, and talked with voters who were going to vote. Even though it did not have a significant impact on the elections, they did not respect the distance required by law. At 2.00 pm, the polling center E.P. 10 Dezembru-Comoro received the visit of PNTL Superintendent M. Longuinhos Monteiru, Vice-Superintendent M. Afonso de Jesus and Dili District’s Commander M. Pedro Belo. When we asked the Fatuhada Chefe Suku about the presence of the Superintendent and his other officials, he said that he had called them and asked them to come and patrol. We believe that the Chefe Suku violated the law, because he does not have the authority to contact anyone in relation to the polling process. Indeed, the STAE head of the polling station (brigada) is the only person with this responsibility according to the law. At the polling centers where we observed, we noticed some positive changes made by STAE officials compared with the first round of the elections. For example, the limited number of candidate representatives fiskais resulted in more space for STAE officials and for voters when voting. But at Sede Suku Bidau-Lecidere and EP. No.1 Tutuala (Lautem), there was no place for observers to sit and observe. At the polling center E.S. 12 Novembru (Dili) the brigada limited our observation to 5 minutes only in each polling room. At Sede Suku Bidau-Lecidere, the brigada asked us to leave the veranda, but we could continue observing over the wall. At the polling center EP. No 1 Farol, we observed that all the ballot boxes were outside, sometimes without sufficient security to ensure their protection. We think that we should pay real attention to these ballot boxes, guarantee that nobody can destroy them, and put them in a safe place, even if so far the elections went well. At the polling center EP. Fatuhada, STAE officials undertook the ballot counting outdoors, in an open place. We observed that this process went well and was transparent, but the brigada should be careful because a strong wind can carry away the ballot papers spread out on the table. If a problem arises because a strong wind carries away the ballot papers, who will ensure the security of these ballots? At the polling center EP. 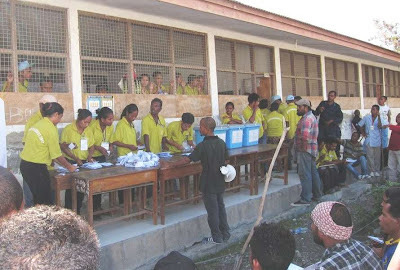 Fatuhada, some STAE officials did not wear the official STAE shirt that indicates that they work independently to facilitate the whole election process. This can confuse the public. We observed that some electors brought an electoral card with a hole in it, an expired passport (invalid), while other electors used a billete-identidade (BI), or a recommendation letter. This provoked a quarrel at the polling centers, as they demanded to vote but could not, because the brigada confirmed that their names were not on the list. At the polling center EP. No 1 Tutuala, an elector tried to vote with an electoral card whose name appeared on STAE’s list, but whose picture was not the elector’s one. This resulted in a quarrel and the brigada decided that that elector could not vote. At the polling centers sede Suku Kampung Alor and EPS. 30 de Agostu, some voters brought their BI, but as their name did not appear on the list prepared by STAE, the brigada did not allow them to vote. We think STAE took the right decision in each case, not to allow people to vote if their electoral card does not fulfill the conditions in the procedures. We also observed that when STAE officials started to close the ballot boxes (kaixa), and to read the seal number (segel), they just read the number written on their list, and not the one engraved on the seals themselves. In some polling centers, officials read the ballot boxes’ seals number, but did not confirm with the number written on the list. We think that this practice can reduce confidence in the system, possibly allowing manipulation of the ballot boxes. We also observed that electors voted freely, bringing their mobile telephones and cameras into the voting booth. As this can encourage manipulation and give opportunity for people to sell their votes, we think STAE should create a regulation and inform all voters that when they go into the voting booth, they should only bring their ballot paper, and must leave their things like bags, mobiles and wallets outside. At some polling centers, the polling booths were located with their backs to a window or an open space, and people could look from outside and see how people were voting, which can cause problems. That is why we think STAE officials should be careful when they put up the polling booths, and find a safe place to guarantee every elector’s rights and privacy. We recommend that everyone, including STAE and PNTL officials who are in charge of security, should comply with Electoral Law n.o 6/ 2011 of June 22, article 36 line 2, about the required distance police must keep from the polling center and station. STAE and CNE need to inform clearly police, in charge of security, that they should respect the Electoral Law. They should not stay near the polling center talking to voters going to the polls. We recommend that all police officers wear a shirt indicating complete identity, including emblem or rank, to show that PNTL ensures security during the whole electoral process. STAE and CNE should educate local authorities about the election process, so that they (xefe suku and xefe aldeia) know their roles during the election, to prevent conflict of interest. When the ballot boxes are about to be opened, and the seas numbers to be read, we recommend STAE officials to read the seals, while fiskais and observers check if the seals numbers on the list and on the boxes are the same or not, to prevent any manipulation. We recommend STAE to make posters or banners explaining which documents electors can use to vote according to the Electoral Law, and hang them in the polling centers. We recommend all STAE officials wear the official shirt chosen by STAE during the whole election process to fully secure the election process and avoid public confusion. STAE needs to better instruct the STAE staff in the polling centers that they must not abandon the ballot boxes. We also suggest preparing a safe place to reduce the security risks encountered by ballot boxes that are just left out. We recommend that the National Parliament amend the Electoral Law, especially article 40 requiring voters to vote at the village where they are registered. 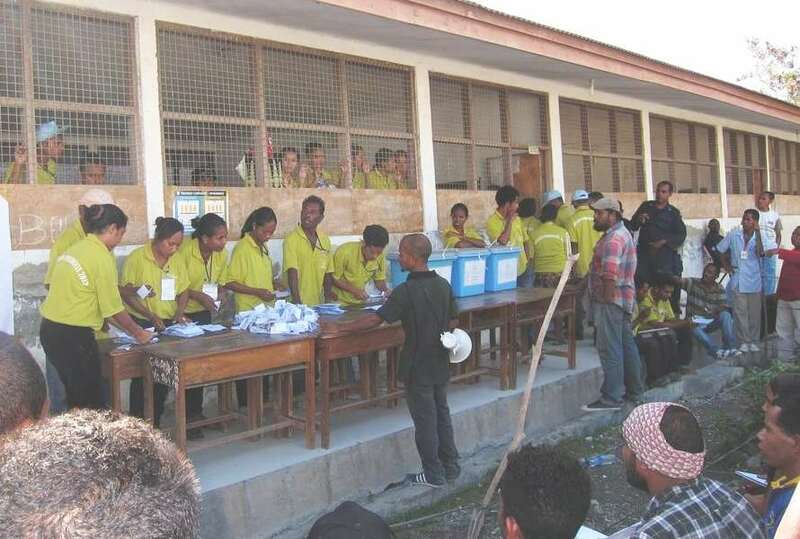 This will facilitate voters’ participation in the parliamentary elections anywhere on Timor-Leste’s territory. We also ask the non-elected candidate to promptly recognize the victory of the other candidate, informing his supporters quickly about his loss, and congratulating the winning candidate. This will avoid confusion among people and prevent conflict. 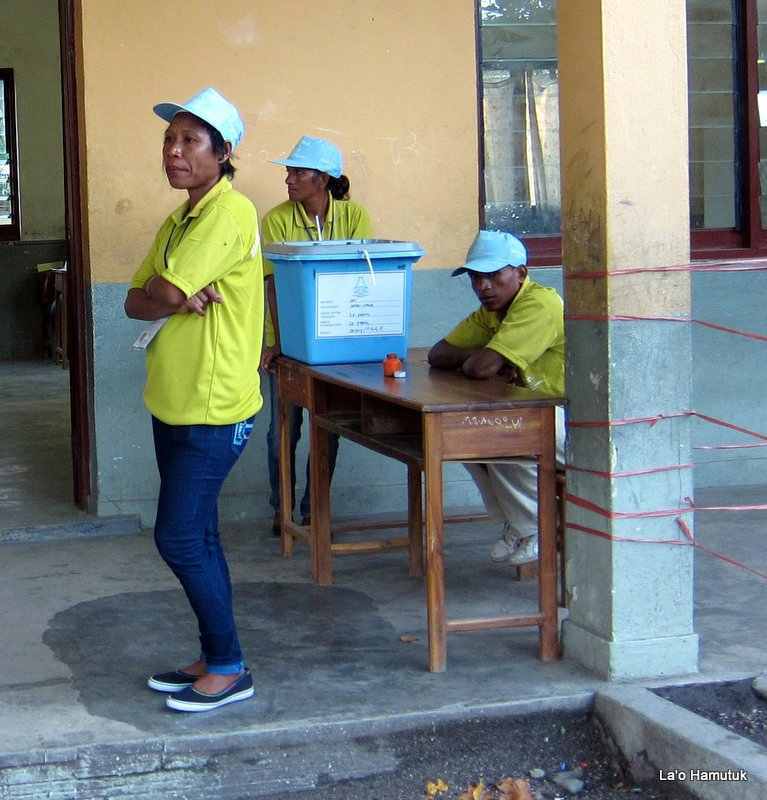 We appreciate the maturity of Timor-Leste’s people, who participated in the 2012 presidential elections conscientiously and without intimidation, and came and voted freely for the future of Timor-Leste. Congratulations again to STAE and all its officials, CNE, PNTL, and all the authorities that together made the process work well. To conclude our observation letter, we must not forget to thank STAE and all entities for their attention and collaboration. Hanesan ita-boot hatene, La’o Hamutuk tinan barak ona servisu atu ajuda Governu, Estadu no povo Timor-Leste atu dezeña no implementa polítika sira ne’ebé efetivu ba planeamentu, orsamentál no dezenvolvimentu ekonómiku ne’ebé sustentável. Ita kompartila ita-boot nia kometimentu katak transparénsia no asesu públiku ba informasaun nudár komponente esensiál husi prosesu dezenvolvimentu, no sauda “Modelu Transparénsia Timor-Leste” no inisiativa seluk atu halo povo Timor-Leste hatene liu tan oinsá ita nia rekursu sira ne’e uza hela ba. Infelizmente, implementasaun modelu ida ne’e la hanesan ho promesa, no ami hakarak ita-boot atu hatene katak ema balu halo deklarasaun ne’ebé la reflete ba saida mak povo hetan, ne’ebé sein duvida diferente kompara ho saida mak ita-boot bele asesu iha Ministériu Finansa laran. Maske ezemplu balu tuir mai ne’e la’ós iha ita boot nia area responsabilidade nian, maibé ami espera katak buat sira ne’ebé ami aponta ne’e sei ajuda ita nia objetivu ne’ebé mutual. Portal Transparénsia Orsamentál: ami suporta konseitu Portal Orsamentu no apresia esforsu Ministériu atu halo portal ne’e atuál no komprensivu. Semana kotuk, Sekretáriu Estadu Rekursu Naturais hateten iha Konferénsia Internasionál ba Paz no Rekonsiliasaun katak portal ida ne’e inklui informasaun detailladu, no hateten bele hetan kombustivel hira mak nia ajénsia uza ona. Infelizmente, nivel detailladu ne’ebé iha hela ne’e sei presiza esplikasaun barak tan. Ezemplu (hare anexu), portal hatudu katak SERN gasta tokon $4.4 entre 1 Janeiru no 26 Abríl 2012, tokon $3.8 ba “grant/konsesoes públiku” husi sira nia Diresaun Planeamentu. Informasaun detailladu importante hatudu katak tokon $4.1 grant tiha iha Fevreiru, no osan tama fali iha Abríl tokon $0.3. Laiha informasaun kona-ba osan ne’e gasta ba saida, transfere ba se, no transfere husi ne’ebé. EITI (Inisiativa Transparénsia Indústria Extraktiva - ITIE): 1/3 husi tinan 2012 ita pasa tiha, maibé laiha relatóriu EITI 2010 ka 2011 nian mak publika. No entantu, Timor-Leste kontinua atu hatudu orgullu hodi sai “nasaun ba dala toluk iha mundu mak hetan status kumpridor ba EITI iha Jullu 2010.” Maske regra EITI fó lisensa ba Timor-Leste atu publika nia relatóriu to’o 2012 nia rohan, publikasaun ne’ebé tuir tempu sei konsistente liu ho espíritu EITI. Fulan sanulu resin hat liu tiha entre publikasaun relatóriu EITI Timor-Leste ba 2008 no 2009, no fulan 14 seluk ita pasa tiha sein relatóriu “annual” ne’ebé tuir. Portal Rezultadu Governu: ami apresia inisiativa foun ida ne’e no hare ba nia dezenvolvimentu oin mai. Momentu ne’e, portal ne’e hatudu liu vizaun duke rezultadu loloos. Husi projetu 25 ne’ebé atualmente inklui iha portal, projetu rua de’it mak “finished,” neen “planned” no restu iha “in progress.” Ami espera katak portal ida ne’e sei haluan atu inklui barak tan duke planeamentu no konstrusaun ba objetu fíziku boot sira, nune’e povo sira bele hare oinsá Governu fó asisténsia edukasaun, saúde, servisu no infrastrutura lokál ba povo sira iha rai laran tomak, espesialmente iha area rurais. Ida ne’e sei ajuda liu bainhira portal inklui informasaun kona-ba númeru osan ne’ebé aloka tiha no gasta ba kada projetu, no oráriu atu kompleta projetu, aléinde atu hatudu persentajen. Transparénsia orsamentu Parlamentár: Timor-Leste daudauk ne’e orgullu los katak debates ba orsamentu tomak iha sesaun plenária Parlamentu Nasionál ne’e nakloke ba públiku no fó sai direta liu husi radio no televizaun. Infelizmente, restu husi prosesu orsamentál la transparente. “Audiénsia públiku” husi Komisaun Parlamentár taka ba media no públiku, maibé ba konvidadu espesiál de’it. At liu tan, prosesu orsamentál tomak ne’ebé aprova husi Konsellu Ministru ne’e hala’o ho segredu, ho laiha informasaun tomak no konkretu ne’ebé bele asesu husi ema sira ne’ebé la’ós parte Governu. Infelizmente, transparénsia la aplika ba “totalidade diskusaun Orsamentu Jerál Estadu,” (komunikade imprensa) maibé aplika de’it ba faze final Parlamentár nian. Relatóriu enkontru Konsellu Ministru: maske informasaun ida ne’e tuir tempu ba saida mak Konsellu Ministru diskute no saida mak deside ne’e iha valor, komunikadu imprensa ne’e dala ruma laiha informasaun ne’ebé sufisiente, no dokumentu ne’ebé bele ajuda ka material detailladu seluk dala barak imposivel atu hetan. Maske lei no rezolusaun sira sei publika iha Jornál da Repúblika hafoin fulan balu, hafoin envigora, promesa naruk ba gabinete informasaun públiku Konsellu Ministru nian seidauk la’o. Obrigado barak ba ita-boot nia konsiderasaun, no ami sei hare ba tan atu kontinua komunikasaun no pronto atu fó hanoin hodi ajuda Governu atu halo informasaun públiku iha dalan ruma ne’ebé ami bele. Cc: Primeiru Ministru, Sekretáriu Estadu Konsellu Ministru, Sekretáriu Estadu Rekursu Naturais, Asesor Sosiedade Sivíl ba Primeiru Ministru, Prezidente Parlamentu Nasionál, públiku. Yesterday, La'o Hamutuk delivered a letter to the Minister of Finance and other key officials informing them of shortcomings in the Timor-Leste Transparency Model, especially the Government's Transparency Portal. The English version of the letter follows; it can also be downloaded as a printable PDF in Tetum or English. As you know, La’o Hamutuk has worked for years to help the Government, State and people of Timor Leste design and implement effective policies regarding planning, budgeting and sustainable economic development. We share your commitment that transparency and public access to information are essential components of the development process, and welcome the “Timor-Leste Transparency Model” and other initiatives to make Timor-Leste’s people more aware of how our resources are being used. Unfortunately, the implementation of this model does not yet meet its promises, and we would like to make you aware that some people make claims which are not reflected in what is available to the public, which is undoubtedly different than what you can access from inside the Ministry of Finance. Although some of the following examples are outside your area of responsibility, we hope that pointing them out will assist our mutual goals. Budget Transparency Portal: We support the concept of the Budget Portal and appreciate the Ministry’s efforts to make it current and comprehensive. Last week, the Secretary of State for Natural Resources told the international Peace and Reconciliation Conference that this portal included detailed information, and said one could look up how much fuel his agency has used. Unfortunately the level of detail available leaves much to be desired. For example (see attached printout), the portal shows that of the $4.4 million SERN spent between 1 January and 26 April 2012, $3.8 million was for “public grants” from their Planning Directorate. The most detailed information shows that $4.1 million was granted in February, and negative $0.3 was granted in April. There is no information about what the money was used for or who it was transferred to and from. EITI: One-third of 2012 has already passed, but neither the 2010 nor 2011 Extractive Industries Transparency Initiative (EITI) reports have been published. Nevertheless, Timor-Leste continues to show pride in having been the “third country in the world to be awarded EITI compliance status in July 2010.” Although EITI rules allow Timor-Leste to publish its 2010 report until the end of 2012, more timely publication would be more consistent with the spirit of EITI. Fourteen months elapsed between the publication of Timor-Leste’s EITI reports for 2008 and 2009, and another 14 months have passed without the next “annual” report. Government Results Portal: We appreciate this new initiative and look forward to its further development. At the moment, it shows more vision than actual results. Of the 25 projects currently included in the portal, only two are “finished,” six are “planned” and the rest are “in progress.” We hope that this portal will be expanded to include more than the planning and construction of large physical objects, so that people can see how the Government is providing education, health care, services and local infrastructure to people across the country, especially in rural areas. It would also be helpful if the portal included information about the number of dollars allocated and spent for each project, and the timetable for completion, in addition to the percentages shown. Parliamentary budget transparency: Timor-Leste is rightly proud that the entire budget debate in the plenary sessions of the National Parliament is open to the public and broadcast live on television and radio. Unfortunately, the rest of the budget process is not so transparent. “Public hearings” of Parliamentary Committees are closed to media and to the public except by special invitation. Even worse, the entire budget process prior to approval by the Council of Ministers is conducted in secrecy, with no overall or concrete information available to anyone outside Government. Unfortunately, transparency is not applied to “the complete discussion of the State Budget,” (Government press release) but only to its final Parliamentary phase. Council of Ministers meeting reports: Although this timely information on what the Council of Ministers has discussed and decided is useful, the brief press releases rarely contain enough information, and supporting documents or other detailed material is often impossible to obtain. Although laws and resolutions will be published in the Jornál da República months later, after they have been enacted into law, the long-promised public information office of the Council of Ministers is not yet operational. Thank you for your consideration, and we look forward to continuing communication and remain ready to help the Government make information public in any way that we can. Cc: Prime Minister, Secretary of State for the Council of Ministers, Secretary of State of Natural Resources, Civil Society Advisor to the Prime Minister, President of National Parliament, public.